CALGARY -- Alberta Premier Rachel Notley says the province is likely to end up owning a piece of the Trans Mountain pipeline. Ottawa agreed to buy the Alberta-to-British-Columbia crude conduit this spring for $4.5 billion from U.S. company Kinder Morgan. Kinder Morgan (KML.TO) had threatened to walk away from a planned $7.4-billion expansion to the line because of resistance from the B.C. government. Notley announced in May that her government would make up to $2 billion available, if necessary, to keep the project going. The federal and provincial governments want Trans Mountain to go ahead because it would enable Canadian crude to be shipped by tanker to countries other than the U.S. market. 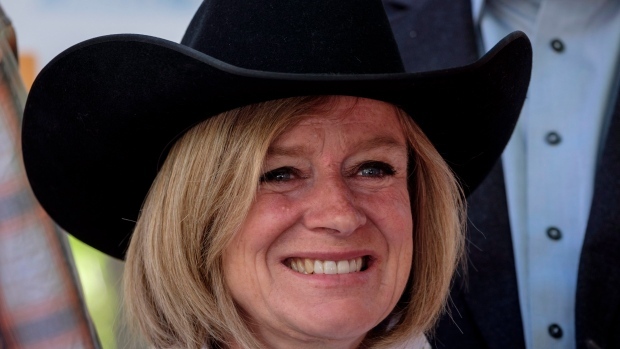 Notley said at the premier's annual Stampede pancake breakfast in Calgary that her government is likely to buy a small equity stake in the pipeline. "I think there's a good possibility ... but I honestly can't get into much more detail on it until all the final decisions are made," she said Monday. "What I will say is whatever role Alberta takes is one that will absolutely be fiscally responsible and there's a good, solid business case for it. If anything, it will open up opportunities for other Albertans." After flipping flapjacks for crowds gathered outside the government's downtown Calgary offices, Notley met with her cabinet. She told ministers that pieces of pipe have already arrived at yards in the industrial area of Acheson, just outside the pipeline's starting point in Edmonton, as well as in Edson, Alta., about 180 kilometres to the west. The Acheson site is about a quarter full and the Edson site is half full, Notley said, and construction is on track to begin this month. Trans Mountain would triple the amount of Alberta crude flowing to the B.C. Lower Mainland. Once the expansion is complete, the oil is to be loaded onto tankers and shipped across the Pacific. Trans Mountain outlines construction plans for next six months in Alberta, B.C. Canada's $40B LNG hopes rise as Shell ramps up in Kitimat, B.C.